Health grills are all the rage nowadays, aren’t they. George Foreman started off the trend some years ago, but has increasingly come up against rival grills. The Tefal OptiGrill is one such rival, but with a few extra tricks up its sleeves. It is an electrically heated grill, similar to the George Foreman grills. Tefal says the grill will cook a steak to restaurant perfection and will also cook from frozen. It costs £150, so is not the cheapest grill on the market by a long shot. It is big and bulky too but it will cook some tasty treats. As said, it is big, so big that we had to move the juicer and find a new home for the breadmaker in our admittedly tiny kitchen; although it can cook up to six pieces of meat in the grill itself. It is also 6kg in weight, making it heavier that a family size George Foreman. The extra weight is due to the top metal lid. This is heavy so that meat is cooked evenly. The controls for the grill are on positioned on the hefty handle. The options offer an on/off switch, and individual modedefrost, burger, chicken, bacon, sausage, steak, and fish. If you know what you are doing, there is also a manual mode as well as an OK button. On the right is the LED-cooking indicator that changes colour as food cooks. The OptiGrill can detect and adjust its cooking times depending on how many items are placed on the grill. As mentioned before, the LED indicator changes colour to tell you whether your food is cooked or not. It can also tell you when a steak is rare (yellow), medium (orange), or well done (red). It will also beep at each stage. The individual meat options will also cook food depending on what they are. The cooking light will let you know when the grill is ready to use. In use, we found that whole pieces of meat work better than strips of food. As with these health grills, the angle of the pan means that fat runs off the meat. When you have finished cooking, the grill plates can be taken off and stuck in the dishwasher. Overall, while the OptiGrill is bulky it does cook very well and is satisfying to eat. 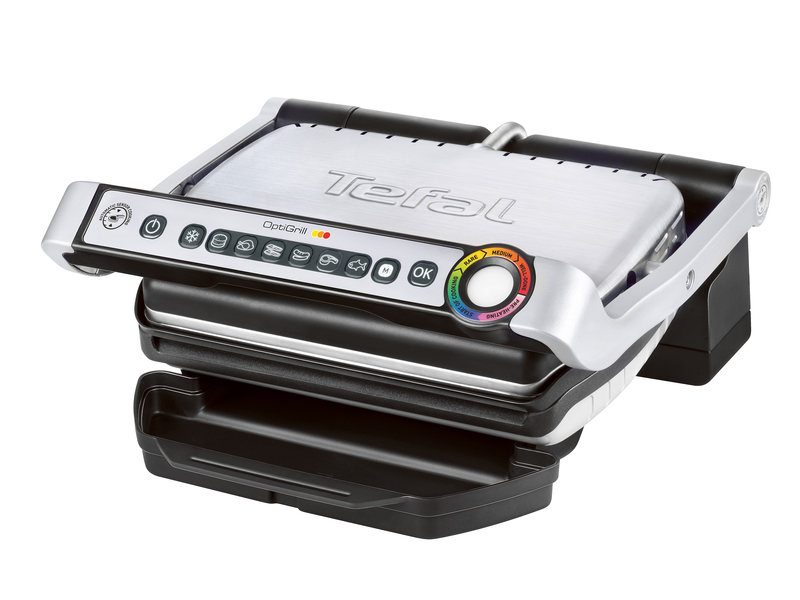 The Tefal OptiGrill is available from Amazon from £119.00.